Why did you decide to run the Amica Newport Half Marathon? 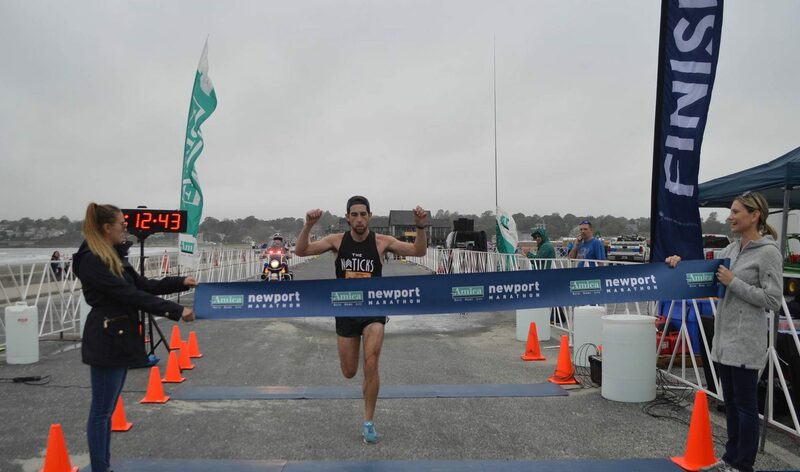 I ran the Amica Newport Half Marathon because I was gearing up for a full marathon later in the fall and knew this would be a challenging course that would test my ability. I thought about doing the full, but started my training a little late to give it my best effort, so the half offered me a chance to run a good course and see where I’m at. We ended up getting a pretty good day with the weather, and this race really helped me to learn what I needed to work on in my training afterward. On top of that, I knew there’d be more spectators than some other races to help motivate and cheer you on, which is great if you’re competing or just trying to tackle your first half. What makes running in Newport so special? I’ve spent a lot of time in Newport over the past few years. There’s so much to do, and my band plays in a lot of the venues around town, so I’m there more often than I used to be and I love it. I’ve run the half in the spring a few years ago and had a bit of knowledge of the course and knew it’d be a challenging but great race to run. It’s pretty cool to go down Memorial Boulevard and see people out on the street watching. Ocean Drive can be a challenge with the wind and the hills, but it’s very scenic and there are people scattered throughout cheering you on. The best part about the half is picking up speed on the downhill at the end and finishing on the beach with a big crowd. I know so many people that do or have done this race, so I wanted to make sure I put it a really good effort that day and prove to myself what kind of shape I was in. What do you love about the half marathon distance? I think my favorite part of the half marathon is that it isn’t a full marathon! In all seriousness, it’s a difficult distance to run, and you can’t fake the kind of shape you’re in. If you want to run well, you can’t rely on pure speed, you’ve got to have endurance in your legs. Fortunately, if things don’t go right, the recovery to get out and try it again is a much quicker turn around than from a full marathon. If you’re looking into doing a full marathon, doing the half is a very practical way of gauging the kind of shape you’re in and can provide some insight towards your strategy in the full. I’ve done a few fulls now, and am sure I’ll run this full someday, but this year it made more sense for me to do the half. What does perfect race day weather look like to you, and what do you wear? Perfect race day weather for me is probably a little overcast with temperatures in the 40’s-50’s. Running in New England, you never know what you’re going to get, and more often than not it won’t be ideal, so if you can get those conditions, you want to capitalize on it as much as you can. Training in all kinds of weather is a great way to prepare for race day. My attire for race day is almost always the same: race flats, comfortable ankle socks, running shorts, my Naticks tank top, maybe a baseball cap, and if it’s cold (40 or below) I’ll bring some old gloves. I’ve always got warm-ups, so I’m comfortable before the start and have something to put on as soon as I’m done. The best piece of advice I’ve gotten is just to be prepared. Think of everything that can go wrong, and do what you can to minimize the chances of it happening, or figure out how you will handle a problem if it comes up. Specifically for running, this includes everything from an extra pair of shoes with you in case it’s raining beforehand and you want to switch right before the start of the race, to doing your training runs in all sorts of weather (heat, snow, wind, rain, mild, cold, etc.) to prepare for bad race day weather. 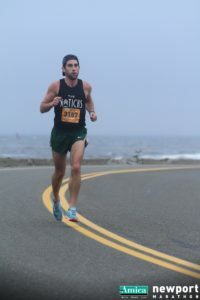 When I got onto Ocean Drive this past year, the wind picked up a bit, but I’d run in it so much leading up to this race, that it wasn’t something that was on my mind as I was heading back towards the finish.